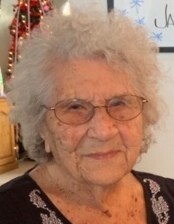 Obituary for Violet M. Christy | Fox Funeral Home, Inc.
Violet M. Christy, 103 of Butler, formerly of Natrona, passed away on February 5, 2019. Born July 22, 1915 in Butler County, PA, she was the daughter of the late Alfred John Reese and Henrietta Dillamen Reese. She worked in the laundry department at Allegheny General Hospital and also various area nursing homes and restaurants. She was a member of New Life Christian Ministries. Violet loved crocheting, shopping, cooking, traveling, spending time with her friends and family and attending church. Surviving are many grandchildren, great grandchildren and great great grandchildren. In addition to her parents, she was preceded in death by her husband, Glenn A. Christy, 5 children, Glenn, Elmer, John, Dolores, and Lil, and her siblings and step siblings. A private graveside service was held at Mt. Varnum Cemetery with Rev. Chris Marshall officiating.